Arlington-based Skybuilt designs portable renewable power stations for the Department of Defense and CIA and has been called the "Dell of renewable energy systems." The company is currently displaying a demonstration unit in a parking lot off Interstate 66 and Quincy Road in the Ballston area. The solar and wind power combination provides an impressive glimpse into our clean energy future. 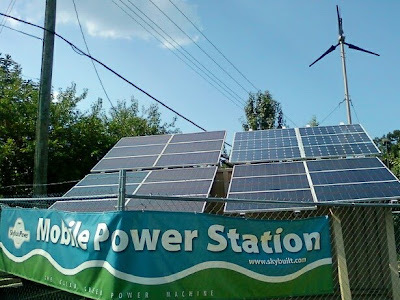 Josh - Thanks for your posting - FYI, this demo model - our first one - has been running continuously, producing power since 2004 - no fuel, no maintenance, etc. It's powered by solar + wind + batteries - can be set up by one person in one day (two persons is better to avoid a bad back!). It became the basis for what we've been doing for powering telecoms,DHS, Army, USAF, intelligance, tactical operation centers, rapidly deployable airfields, disaster relief, etc. See SkyBuilt.com for details. Dave Muchow, Pres. & CEO, SkyBuilt Power.